The global ecommerce market is in a state of both expansion and consolidation. More consumers than ever before are buying digitally, and worldwide retail ecommerce sales are rising. At the same time, major international players like Amazon and Alibaba are widening their reach by buying up smaller local platforms, especially in burgeoning ecommerce markets. eMarketer estimates that worldwide retail ecommerce sales will increase from $2.290 trillion in 2017 to $4.479 trillion by the end of 2021, equating to 16.1% of total retail sales. On a global level, Amazon and Alibaba are the largest players. Amazon dwarfed all other companies in a January 2017 report by Deloitte showed that Amazon’s retail ecommerce sales for its fiscal 2015 reached $79.27 billion—nearly triple that of the second largest digital retailer on the list, China-based JD.com ($26.99 billion). Apple took a close third place, at $24.37 billion, followed by Walmart ($13.70 billion) and China retail giant Suning Commerce Group ($8.10 billion). 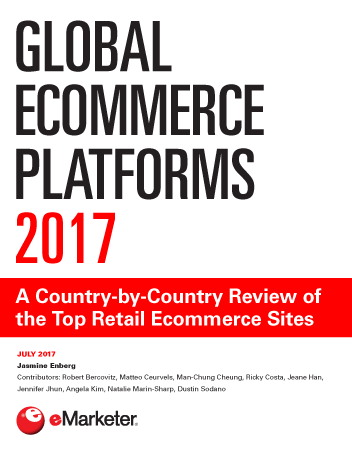 This article is drawn from a new eMarketer report, “Global Ecommerce Platforms 2017: A Country-by-Country Review of the Top Retail Ecommerce Sites,” which provides detailed breakdowns of ecommerce platforms and usage for 30 markets around the world. Subscribers to eMarketer PRO can access the report here. Alibaba is not featured on Deloitte’s list, likely because the data excludes consumer-to-consumer (C2C) sales and sales from third-party sellers, both of which make up a large part of Alibaba’s business. When those are included, however, Alibaba is likely on par, if not ahead, of Amazon. Overall ecommerce sales data for the firm is hard to come by, but Alibaba’s own figures showed that RMB120.7 billion ($18.2 billion) worth of products were sold on its platforms during Singles Day in 2016—the online shopping festival that occurs on November 11 every year. This was up from RMB91.2 billion ($13.7 billion) in 2015. That’s nearly one-fifth (17.3%) of Amazon’s total sales for its fiscal 2015, according to Deloitte. Amazon has also been at the forefront of consumers’ shift toward digital shopping channels. According to a February 2017 report from PricewaterhouseCoopers (PwC), more than one-quarter (28%) of Amazon shoppers worldwide said they shopped less often at retail stores because of Amazon; this share was even higher among US shoppers, at 37.4%. Another 10% of global respondents said they only shopped on Amazon. Amazon’s success has also been a driving factor in the rise of other online marketplaces, including Argentina-based MercadoLibre and Japan’s Rakuten. Many of those platforms have been able to hold their own against Amazon in their home markets, and there are some places where Amazon has been unable to gain significant traction. Amazon’s struggles in the Middle East, for example, led it to purchase the region’s largest ecommerce platform, Dubai-based digital marketplace Souq.com, in March 2017. What’s more, Amazon still does not have a local presence in Southeast Asia, due in large part to the overwhelming popularity of Singapore-based Lazada in the region’s six major markets. If and when Amazon does enter Southeast Asia, it will be competing head-to-head with internet giant Alibaba, which purchased Lazada last year. The two are already in direct competition in India, where Alibaba and its affiliate Ant Financial have bought a 42% stake in local payments and ecommerce platform Paytm. Paytm launched an online marketplace, Paytm Mall, in February 2017. Amazon’s and Alibaba’s acquisitions mean that the global ecommerce landscape is consolidating. Despite this, there are still a host of smaller, specialized digital retailers that continue to be successful. In the latest episode of eMarketer's "Behind the Numbers" podcast, forecasting analyst Jasmine Enberg and ecommerce analyst Yory Wurmser step back to take a global view: How and where do consumers in different markets spend their money online?